We're big on walking, getting outdoors and exploring in our family - we try to go for a walk each weekend, even if that is just a little wander locally. There are so many benefits to walking, especially for children, and it's a wonderful activity in which all the family can get involved with; children, parents and grandparents even. 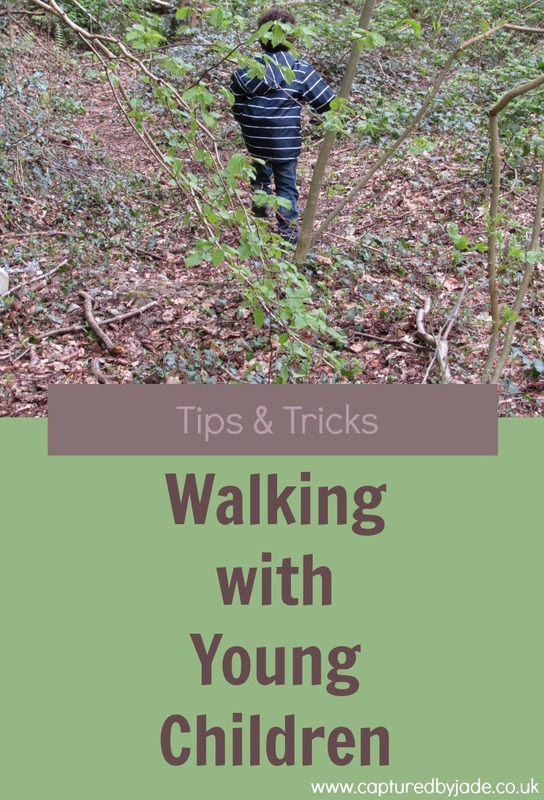 I've been wanting to write this post for a while now but had yet to get round to it, however with May being National Walking Month, I thought what better time to sit down and share some tips and tricks when it comes to walking with young children. We aren't drivers ourselves, and so we rely on public transport or our legs to get us from A to B, however if you are a family who regularly uses a car to get about then it's a good idea to start small with your walking adventures. This also applies to just getting children into walking longer distances in general. Alexander walks the route to and from preschool daily (depending on rain), however this isn't a 5 minute wander down the road to the local school, the journey takes him roughly 40 minutes there and then 40 minutes back. At three years old, Alexander absolutely loves walking this route and checks the weather in the morning to see if he'll be walking that day. Naturally, it took us a while to build up to this journey, so when he first started preschool we would bring the buggy along and split the journey up in two halves - the first in the buggy and the second walking. Walking to and from school is a great way to start building an interest in walking with your children. Whatever you're hoping or expecting the outcome of your walk to be, lower them. That's not to say you don't have trust or faith in your child's abilities, but as a parent myself I know we can often expect a lot from our children. Lowering expectations is great for a number of situations when it comes to children, not just walking; travel is another good example. Sounds kind of silly right?! You are walking with your child on a family walk, but what I mean by that is walk at your child's pace. Yes... Children, in particular young children, walk at a super slow pace sometimes, but they do only have little legs! One of the reasons you're on this walk in the first place is to get outside with your children, let them explore and get fresh air, so why rush them along when often times they dawdle to take in their surroundings. Also, I'm sure we've all been in a situation when we've needed to rush our children along, and it never ends well, so don't turn your tranquil family walk into a stress inducing situation. Tying in with expectations and child's pace is knowing your child's limitations... This is will get easier to learn as you go along in your walking journey. If you're heading out on a 3 mile walking trail, assess whether you think your child will walk the entire route, and if not, remember to turn back or find a short cut before your child reaches their walking limit. Make sure you're starting out your walk on good footing by dressing appropriately. My top two things when it comes walking attire are good supportive footwear and a raincoat. This applies not only to children, but yourself also. Walking, especially for long distances, is hard work. Using up a good amount of energy, you will get hungry and you will get thirsty. Also, children tend to get hungrier quicker than us adults do... Or maybe my child is just an eating machine! Make sure you have water on hand as well as energy boosting snacks - we like nuts & fruit (fresh or dried). You could also bring a full on picnic along for food, and use the opportunity to give tired legs a break. Do some research into the route you are hoping to take - know what is around there, what facilities are on hand, is there parking, are there more than one route, is there a café, is the route child friendly etc. By knowing these things in advance, you can't be taken by surprise at your destination. Most council websites will have a section for local walking trails, and there are probably local bloggers somewhere that have shared about certain routes and walking spots. Whilst a spontaneous walk is a lot of fun, if you're planning a full on walking trail then putting a little more thought into it is a good idea. Oh, rushing with children is never ends well! Haha! Geocaching is a fun interactive element with walking - glad you and your family enjoy it! Thanks! Whether near or far, a small or long distance, walking is great! ...I hope that you can keep up! Haha! It is quite the job sometimes, Tom! Thanks! Walking adventures are great for burning off some steam... So much energy in little beings! Making walking a fun experience definitely helps... And even I'm lured by the promise of food at the end. Haha! We do quite a lot of walking with the grandkids. Luckily they are quite good now - especially if we have a supply of biscuits and juice to keep them going. It's nice to get out when there isn't a deadline and just go at their pace. Wandering at their own pace is lovely... Such a nice way to spend time together as a family. It's lovely when we learn things from our children, isn't it?! Also, I love seeing children happy outdoors! I've heard so many good things about geocaching, from this post and prior also. Thank you! That sounds like some lovely childhood memories! We didn't do much long distance walking when younger, it is something I really got into when older, but I love being able to share in this activity with all my family. A great way to bring everyone together. Hi! Visiting your country,I knew The National Trust was made by mainly Helen Beatrix Potter and her husband.I enjoyed there very much. Hi :-) I know Beatrix Potter was especially heavily involved with The National Trust in the Lake District where you visited. I'm glad you had a lovely time in the UK. A great post, Jade, with very good tips. Walking/hiking in the fresh air is a wonderful way to live better. Thanks, Chantal - with the warmer months here it's a great time to get more into walking. Haha - oh I remember the tired toddler moments! Thanks! When my kids were small I tried to remember to bring a bag to carry all of the things they collect along the way...rocks, flowers, twigs, etc. They are much closer to the ground at that age so they pick up so much! So true - great tip!